Correctly interpreted, you know, pi contains the entire history of the human race. Consider the quotation from Dr. Matrix, the arch-numerologist of Martin Gardner’s book “The Magic Numbers of Dr. Matrix“. You may laugh, but try to disprove his assertion. Amazingly, Dr. Matrix is probably correct! Let us take the statement to its logical extreme: pi is omniscient. By this we mean that pi encodes in its digits the totality of human knowledge, past, present, and future–and probably more…. An apparently absurd claim–and one which is almost certainly true! 2, 149, 1925, 13808, 49703, …. Now, the pattern “1, 2, 3, 4, 5, 6” does not occur before the 100,000-th term in the digit sequence of pi, which is as far as we perform the search. But this doesn’t show that the pattern doesn’t occur, much less prove that pi can’t “count”. Indeed, how would such a disproof look like, short of being an infinite list of all the digits of pi? Furthermore, statistical studies of pi’s digits indicate that they are randomly distributed. Let’s suppose that this really is the case. Now, the probability of finding a pattern in a random string of n digits approaches 1 as n goes to infinity. (Similarly, the probability of rolling, say, six consecutive 6’s with a die approaches 1 as the number of trials gets large.) Hence, we are “almost sure” to find any pattern in the digits of pi! (Admittedly, a faster Mathematica program can be written.) Exercise: Can you find the first occurrence of your phone number in the digits of pi? s1, s2, s3, s4, …. Define the sequence A(n) by: A(n) = the first place in the digit sequence of pi where the pattern g(sn) occurs. That is, A(n) points to the first occurrence of (the code of) sn in the digit sequence of pi. If A(n) is well-defined for all n, or equivalently, if each sn appears in the digit sequence of pi, then pi codifies all human knowledge. This may appear very unlikely, but can you conceive of a disproof other than an infinite list consisting of all the digits of pi? In fact, the randomness of pi’s digits virtually assures that any sn will occur! Are we condemned to live and die with the perpetually unresolved suspicion that within pi lies the answers to all our questions–indeed, the very secrets of the universe? 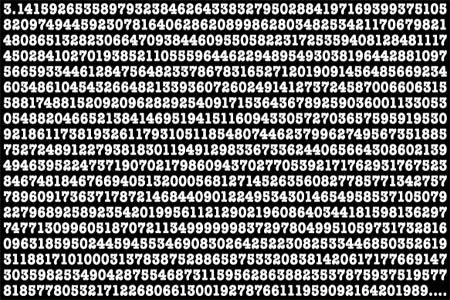 The infinite number of digits of pi is perhaps too much–after all, our knowledge at any one time is finite. Concatenate the digits of (the Gödel numbers of) a current compilation of human knowledge s1, s2, s3, s4, …., sn. The resulting sequence is the digit sequence of an integer which we call an omega number. (Clearly, different encodings of the character set will produce different omega numbers.) An omega number directly encodes human knowledge in its digits. How do we even begin to compute this kind of number? 1/2 = .4999…. = 4*(1/10) + 9*(1/10^2) + 9*(1/10)^3 + 9*(1/10)^4 + …. As you mentioned, this is not the most efficient encoding scheme one can come up with, but it does have the advantage of guaranteeing that every string will generate a unique number. I decided to take it upon myself to create an Omega generator that would take arbitrary text and generate the Omega number for that text. It does not search Pi for the generated number, which would be most likely fruitless, anyway. If this string of digits exists in Pi, then we can say that Pi is self-referential. That is, contained within Pi, is the definition of Pi. This recursive strange loop would then up a proverbial Pandora’s Box of potential paradoxes, would it not? It could well be that the sum of all human (and nonhuman) knowledge is encoded within the digits of Pi in this manner. However, I assert to you that it is possible that this is not the case. While Pi is comprised of an infinite number of decimal digits, I have seen no proof that these digits do not repeat. It is possible, therefore, that Pi is a repeating decimal, like 1/3 = .33333…, 1/6 = 1.66666…, 1/7 = 0.142857142857142857142… It could be that Pi begins repeating after some really huge, though finite, number of digits. If that is the case, then Pi might still encapsulate the sum of all human knowledge, since the sum of all human knowledge is certainly finite. Then again, it might not. Or, it might currently contain all human knowledge until someone comes along and makes a new discovery or writes a new book that happens to not be encapsulated.